Dennis Nerush's Blog: What is not on the Calender does not Exist! What is not on the Calender does not Exist! You know those people who remember EVERYTHING??? Well, I'm not one of them and probably (don’t kill me) neither are you. When you have a job, a hobby (ies), university academic studies, some commitments and a life(!) then every day you have a lot of duties and tasks in all the areas described above. Some are more important than others, some are scheduled for the next day and some are scheduled for the next month. Either way you have to remember them all and eventually do them, however all of us sometimes forget. Most of the time we remember the most important tasks and duties but often we forget the other ones like going to the supermarket, call someone and remind them to do something, some ideas you want to share or maybe a meetup you wanted to attend. 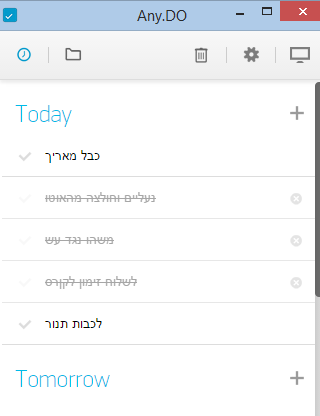 I have a quote: "מה שלא ביומן לא קיים" – "What is not in the calendar does not exist" (the translation is not as neat as in Hebrew – improvements are more than welcome). I believe in this quote since your calendar shows what you are actually doing. A doctor's appointment, work meeting and so on. However all those "blank spots" you leave there are not actually blank – you are doing something it's just not "as important" as the scheduled ones, but is it really? Is going to the gym or the supermarket less important than a work meeting? Perhaps, but the reason that the work meeting is scheduled in the calendar is because you want to be there (not necessarily want to be there but you sure don't want to miss it). Don’t you want to go to the gym? Or don’t forget to go to the supermarket? If you really want things to happen, like going to the gym or calling someone, you have to treat those tasks and duties the same as your "important tasks". Think about this for a second – "All the things you want to do are important"! If it wasn’t important you wouldn’t want them. Yes, some tasks are more important than the others – So they should be scheduled before the other ones. It's ok to postpone something since you have more important things to do right now or you don’t have enough time for it. But it is a decision that you make. You decide not to do something you don’t forget about it. There are plenty of tools and apps to help you manage your day and your life. I use Google Calendar for the scheduled tasks and meetings (yes I have scheduled time to go the gym), I use Any.Do for reminders like calling someone or not to forget to take back my HVR card from my mom. Last but not least I use Trello to keep track of tasks which take time to complete and don’t have a start date – like my apartment duties or the books I'm currently reading and want to read in the future. How do you keep track and manage your day? Your life? Nice post Dennis. I agree with you on the importance of scheduling and writing everything you need to do, though I still struggle with making it a habit that sticks (I am improving slowly though) . I find it easier to schedule my time at work than my "free time". Maybe when I'll switch jobs and be able to use the same tools and apps for both my free time an my job I'll have better success. 1. Use your work calender for your work (and don't forget to fill your blank spots there too! Schedule "working on a document or writing a post in the .NET community" ;)). And schedule your free time in the other tools. Most of the time they don't collide, You can also schedule your job in the "free time" calender like "08:30-18:30 job". I agree the most with the fact that when you "Plan" your schedule, you are the one to decide what to do. If you leave a lot of blank spots, then you eventually end up with "Filling" them with things you probably might think that are not then important.